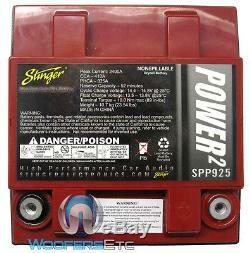 SPP925 - Stinger 1850W 12v Dry Cell Valve Regulated Lead Acid Battery. 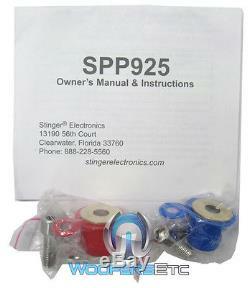 SPP925 includes removable brass battery posts for installation flexibility. 12v Dry Cell Valve Regulated Lead Acid Battery (AGM). SPP Series Batteries are good for over 400 full discharge cycles. Internal resistance: <5.0 mOhms = Ability to quickly deliver power. 20 hour rate: 1.40A/28Ah. 5 hour rate: 4.76A/23.8Ah. 1/2 hour rate:35A/17.5Ah. 5 Second Cranking Amps: 925A. Dimensions: (5H x6.562W x6.875D). You will be issued a Return Authorization Number. In order to maintain an inventory of 100%, Brand New, A-Stock, untouched products, all sales are final. We ask that you please be sure you are ordering the correct product. 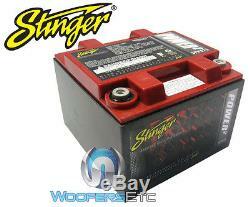 The item "SPP925 STINGER 1850W 12 VOLT HEAVY DUTY DRY CELL LEAD ACID CAR POWER BATTERY NEW" is in sale since Friday, August 20, 2010. This item is in the category "Consumer Electronics\Vehicle Electronics & GPS\Car Audio & Video Installation\Other Car A/V Installation".